I typically kick off each year with what we like to call the “state of school address.” However, the words are not coming to me quite as freely as in years past. I am finding it challenging to relish in our 2017 accomplishments when preoccupied by thoughts of countless families celebrating the holidays for the first time without a beloved member. The year was marked by numerous devastating natural disasters and an attack testing the resolve of the Las Vegas community. As a result, I am taking this opportunity to embrace the “heart” of our students, faculty, and families. “When the going gets tough, the tough get going!” That was certainly the case for our children, as they supported hurricane relief efforts. Students sent handmade cards and origami cranes to the children of Silverline Montessori School in Houston offering words of hope and encouragement, in conjunction to student council members collecting monetary donations campus wide totaling almost $4,000. 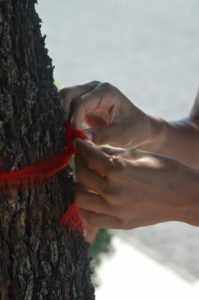 Furthermore, elementary and middle school students decorated Starbucks sleeves offering words of peace, love, and kindness in the aftermath of the 1 October attack, while middle school students marked over 100 trees/poles with red ribbons and placed VegasStrong rocks throughout Henderson in honor of the victims and in demonstration of solidarity. In addition, special appreciation is extended to the 11 students (4th – 8th grade) who participated in the service-learning elective during fall semester. Ms. Ariel guided these young women as they opened up their hearts to offer support in various ways including: making copies for teachers; tidying up the office/staff lounge; volunteering in the primary classrooms to help younger peers with their goals; crafting scarves for homeless students in Clark County; and making care packages for the nurses who worked on the night of the shooting. The acts of kindness and compassion displayed by our children is incredibly heart-warming, and we are humbled to be a part of their journey. We often refer to our community as the “FMS family,” as we experience joy, pride, and loss similarly to a biological family. Celebrating is the easy part, which we were able to do as a team at the AMS conference and the holiday road rally. The marriage announcement of Ms. Ariel was also a highlight. Once again, we were prideful when a former student, Olivia Nhaisi, centered her college admissions essay on her foundational years at FMS earning her acceptance at American University for fall 2018. However, the challenging times define us. Sadly, several staff members and a student grieved the loss of a parent during 2017, including myself. On behalf of all, we sincerely appreciated the unwavering support from faculty and families alike during a time of great sadness. I would also like to express my deepest gratitude and love to the admin team who seamlessly and repeatedly picked up the pieces at a moment’s notice. Last, but certainly not least, a huge thank you to Jessica Colarco for offering her expertise and counseling services to our FMS families and students throughout 2017. FMS parents and families are certainly the lifeline of the school. If the campus is considered the “body,” you are definitely the “blood” supplying an abundance of resources. Our families supported numerous causes during 2017 such as Down Syndrome of Southern NV, Team Sue, NSPCA, United Way, Houston Food Bank, Project Homeless Connect, and the Scholastic Pajama Program. Most recently, our families rallied by donating much needed items in support of the Salvation Army in Ventura County to aid families displaced by the fires, which Ms. Lauren delivered during winter break. Not only do you provide financial support, your gift of time is unsurmountable and invaluable. Parents (current and former), grandparents, aunts, uncles and family friends volunteer countless hours in sustaining the magical community of FMS, not to mention our amazing PTO who work relentlessly on forging the home-school connection. Lastly, one group of FMS parents deserve special recognition. On behalf of the entire FMS community, thank you to all the physicians, nurses, emergency personnel, and law enforcement officers who worked tirelessly during the 1 October attack. We are grateful for your service and your continued daily commitment to your calling. Although this is by far the shortest “state of school address,” it has certainly taken the longest to compose. Words simply cannot express all that we are grateful for nor truly encapsulate the “heart” of the FMS family, so I will simply say “thank you” on behalf of the entire faculty. We are incredibly blessed to have the unwavering dedication of our families, and we are honored by the gift of educating your children. Your gift…their journey…our future…here is to new beginnings! Call 702-407-0790 to schedule your guided tour today!